We are proud to announce that three of our core team members have qualified for Afghanistan's Olympic Women's Running team! 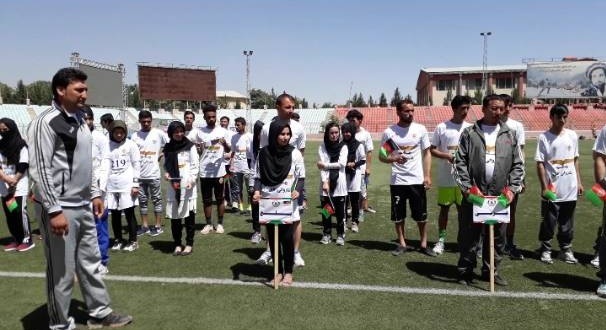 In 2018, women and men from across Afghanistan participated in regional running competitions in an effort to qualify for the National Olympic Games in the capital. The top placing athletes at these Games would secure a spot on Afghanistan’s Olympic Running Team. Three young women from Free to Run’s Northern Afghanistan program, Samargul, Fayeza and Fatima, were among the fastest and qualified for three highly coveted spots on the national team! Samargul came in second in the 400m distance, Fayeza came in second in the 1500m distance, and Fatima came in third in the 400m distance. These young women have been with Free to Run for two years now and have previously completed two full marathons. Q: How are your family and friends feeling about this accomplishment? A: Our families were really happy for us! They came to celebrate our victory by bringing gifts when we reached Mazar. Our family invited our school groups for their encouragement, and I am thankful for Free to Run and my teachers. Q: What’s next in your journey to the Olympics? A: Our province got many trophies and in our distance we got the Golden Trophy so they will invite us to any international races coming up. I believe it will be a special feeling running for a country where there is war going on everyday and we can show the world that we can make it. Q: Do you think this will help improve the visibility of women in sport in Afghanistan? A: It will help us a lot! At first we were a small group [running with Free to Run]. Later on we had 25 members. If we had more financial support, we could have over 100 girls who are interested in running and want to part of the team! For example, at first my family did not allow me to run but Teacher Nelofar* came and talked to them and now my family has no problem regarding races or anything that involves sports. I mean, if we can't change the world, we can change our society at least. Q: Do you think Free to Run helped you get to this point? A: Free to Run is one of the main points of our victory. All our training was with Free to Run, I train in Free to Run shirts, and work as a volunteer with Free to Run. They support us from every side, like shoes, transport and shirts, which help us train well. If we get invited to international races with the Olympic team, we will run for both Afghanistan and Free to Run. *Teacher Nelofar is a Free to Run Program Officer and Ambassador, and a ground-breaking runner. In 2015, Nelofar successfully raced and completed a 250K ultra marathon with Zainab, becoming the first Afghan women to complete an international ultra. Since 2015 she has been leading Free to Run running clubs and sporting events in Northern Afghanistan and participating in the Marathon of Afghanistan. Would you like to help empower young women like Samargul, Fayeza and Fatima? We could use your support. Every donation we receive, large or small, will help us to reach more women and girls in regions of conflict. Donations can be made easily and securely through Paypal, Crowdrise, or JustGiving.